Businesses often need help with fly control in Fife, Perth and Kinross, especially in the food industry. However, it is equally important to tackle fly problems in domestic situations, as certain pest flies carry and transmit diseases and intestinal worms when they indiscriminately move from filth to food. There are many different types of pest fly, so it is essential that the correct identification of the flies is made. At Active Pest solutions, we have 15 years’ experience in domestic and commercial fly control. Based on our in-depth knowledge of flies and their modus operandi, we utilise professional fly control products, equipment and techniques to prevent or remove fly infestations. What’s more, as we are members of the Fife Trusted Trader scheme and Perth and Kinross Better Business Partnership, our working practices, pest control qualifications, customer service and integrity have all been screened by Trading Standards officials. That means you can rely on receiving professional fly control you can trust from APS. 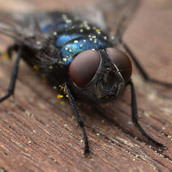 House Flies – These familiar insects start life in rotting organic matter or excrement, which is a nutritional food source required to help the larvae (maggots) grow and develop. They develop into adult flies, which emerge and fly from food source to food source, liquefying their food by dissolving it with digestive juices while depositing harmful bacteria which can cause severe illness in humans. Active Pest Solutions provided fly control in Kirkcaldy when a fish and chip shop owner became concerned at the number of flies entering his restaurant and potentially contaminating prepared food. This sort of situation can present a veritable nightmare for food business proprietors, so he was absolutely right to seek expert advice before the fly problem escalated and began damaging his business. Fruit flies – These pest flies are a major nuisance in pubs, restaurants and homes, as they are attracted to sour milk, rotting fruit and vegetables, as well as wine and beer spillages. Active Pest Solutions was asked to carry out fruit fly control in a pub in Glenrothes after a beer spillage attracted hordes of unwelcome winged visitors. Cluster Flies – These pest flies enter houses and commercial buildings during the autumn months to overwinter, occasionally clustering at windows and doors. Although they don’t carry diseases, they do cause stress and anxiety to occupants, as they can cluster in huge numbers, especially in loft spaces and quiet rarely used rooms and offices. They often pour out of window frames in large numbers when disturbed, which can be extremely unpleasant for workers or for homeowners and their families. Active Pest Solutions has used cluster fly control in Kinross on many occasions, and we are regularly asked to implement this fly control technique in Dunfermline, Glenrothes and other areas in Fife. Blow fly, bluebottles and greenbottles – These flies are primarily scavengers, laying their eggs wherever they can. Rotting fish and meat products are particular favourites for them, as are dead or wounded animals or birds. As you might imagine, these flies make far from charming housemates! Other organic materials such as animal faeces or rotting vegetables can also be used as a site for laying clusters of up to 600 eggs. This provides the emerging maggots with a ready food source to aid their development into adult flies. As if all this weren’t awful enough, these flies can carry diseases harmful to humans. Active Pest Solutions undertook fly control in Kirkcaldy after bluebottle maggots dropped onto staff in a factory, disrupting work operations. We were also required to deal with a fly problem in Leven, where hundreds of bluebottles were found flying around a customer’s bedroom after a jackdaw fell down an unused chimney and died, presenting a perfect host for bluebottles to lay their eggs on. Owl midges (sometimes known as sewage flies) – As their alternative name suggests, these distinctly insalubrious insects breed on the sludge at sewage works. They also breed and grow in wet organic matter at the bottom of household drains or where drains have been damaged, so they often carry disease. Active Pest solutions undertook fly control in a house in Falkland when the distraught owner was unfortunate enough to suffer an owl midge fly infestation just before the potential new owners of her house arrived for a viewing. We were able to help her out quickly and discreetly. We provide one-off visits for fly control in domestic and commercial situations. We also provide regular contract fly control to businesses where good hygiene standards are essential by law, in particular for the food production and food storage industry, but also in restaurants, cafes and takeaways. The Food safety act 1990 states that “to the purchaser’s prejudice, any person who provides any food which is not of the nature or substance or quality demanded by the purchaser, shall be guilty of an offence”. Breaking the law could ruin your business and your reputation – not to mention resulting in prosecution and fines. If you have a problem with pest flies at your home or business premises, contact the fly control professionals at Active Pest Solutions by calling 01577 862035 during business hours or email us any time. We supply and fit a range of fly screens for doors and windows and also utilise electric fly traps, scented fly traps and sticky board fly traps, insecticides, sprays and fogging equipment. As well as providing you with practical solutions, we also offer helpful advice on how to prevent future fly infestations. Cover any food that is sitting out. Keep bins well away from doors and windows. Clean and disinfect work tops and food spillages. Free pest control surveys undertaken by a fully qualified technician. One-off fly control visits to businesses or homes. Contract fly control for businesses. For professional, effective, low-cost fly control, call Derek for a competitive quote on 01577 862035 or email us to request a call-back from Active Pest Solutions.